Home»Gallery of Personalized Fossil Ivory Writing Instruments, Desk Accessories, Globes, Boxes, Display Pieces»Fairy/Whale BoxSold! A truly unique and special box! Handmade in our studio from Sterling Silver, with handmade Sterling Silver hinges. On the top is a 2 1/2 inch Arctic Whale carved from Dark Brown Fossil Mammoth Ivory. He breaches from the chased Sterling sea into a night filled with various sized appliqued Sterling Silver stars. To top it all off, a piece of iridescent silver/blue Abalone Shell on the corner of the top is the Aurora Borealis! And that's not all! On the front of the box is applique'd a wonderful fairy figure! 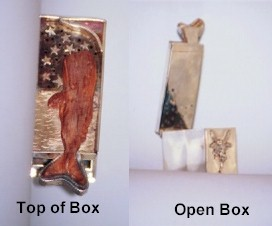 The box measures 1 3/4 inch high, 1 1/4 inch wide, and 3 3/4 inch from front to back. A unique piece for any collector - It can even be used as a special family heirloom box to put children's teeth in during the night, when they lose a baby tooth, and while they are waiting for the tooth fairy to exchange it for money! - Only one available - ever.